Manufactured to our customer's specific application, the control panels manufactured by L.V. Control are designed in-house for reliability, functionality, and ease of use. 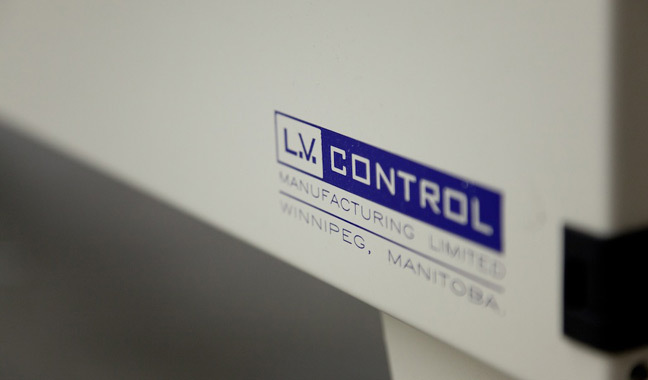 The LV-1000 is a custom electrical control package specifically designed for the grain handling, seed cleaning, and feed processing industries and manufactured in our Winnipeg facility. The LV-3000 has been specifically designed for fertilizer blending and handling facilities. The integrated distribution and motor control of our control panels make them suitable for use as stand-alone packages or as additions to existing electrical systems. Our unique concept allows an operator to confidentaly control any size of operation from one central location with a minimum number of programming steps. Several options are available that further ensure fail safe and reliable operation of the system being controlled. All of our control systems include the system layout silkscreened onto the panel face, and operators are provided detailed operation manuals and electrical drawings. CEMA 12 Enclosure: Dust-tight to protect control components. Main breaker disconnect: Complete with door interlock, ensures that no “live” terminals are exposed when the door is open. Low Voltage Control Circuit (VAC): Low voltage control transformers provide safe, reliable and economical operation. Analog ammeter: Displays motor loading on a major motor, such as a bucket elevator or roller mill. Selector Switch and Run Light: Provides automatic/manual control and status. Motor Interlocks: Prevents system plugging and equipment damage. Program Selector Switches: Allows the Operator to select the “sender” and “receiver” for any specific grain or feed moving application. Full Voltage Combination Starters: All starter are complete with ambient compensated overload relays and thru-door resets. Time Delay: Provides for a sequential shutdown of equipment for clean-out prior to shutdown. Custom Drawings and Manual: Provides total documentation for the control system by detailing the operation of the system, and can be used for training personnel.